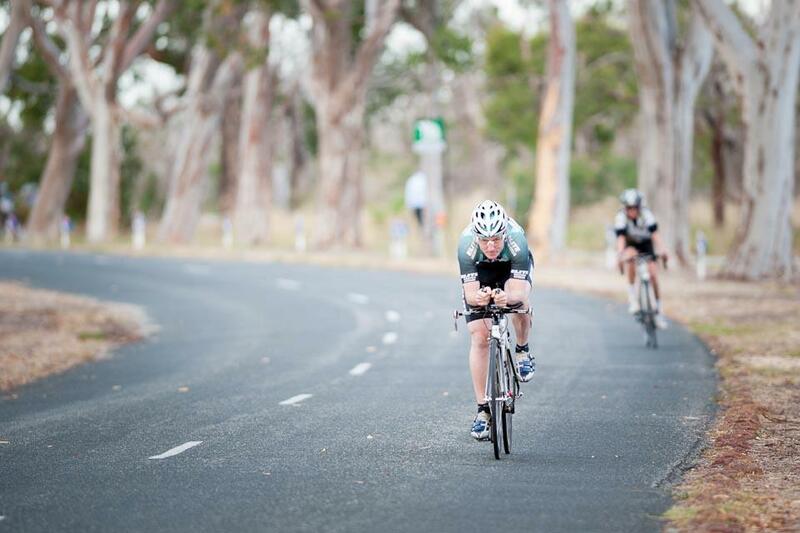 Happy Birthday Bruce - have a great day - no doubt speeding along on one of those bikes! It might well be Australia Day but a girl still has to eat - someone is waiting patiently for Ian to produce some breakfast. And the rest of the day? Well the bathroom mat is a wonderful place to spend our time. it is amazing where we find her. No way of standing on the bath mat after your shower - this cat hates water. Imagine if you dripped on her? Big news of the week is that Let's Play with Romeo arrived yesterday -I thought it was coming on Tuesday but our printers - Fineline Print - are wonderful.It's on the website and available and we are doing some special deals with it. Also, the folder in Outlook with the names of the people has vanished, so I am sorry to have to ask - if you had your name down for a copy, would you mind emailing me again? I have now started work on my next booklet - new series - this lot will be The Artful Journey series and I hope the first one will be out in May. I have been doing some of my simple image transfer on different surfaces - a little bit of playing with regards to my class in Italy (see tab at top) - this is not TAP transfer - if you want really clear images, then TAP is the very best product for that (and of course you can buy it from us) but this is my cheap as one. The one at the top is a photo of the markets at Sulmona (one of the trips we do as part of the week) and i have transferred onto Lutradur - I haven't played with Lutradur for a wee while - it is rather transparent. and the third one is a map of Sulmona I found on the web and transferred it to polycotton - think how super this will be for a background for various other things. And layering. I shall keep working away. Ian has been busy adding things to the web but we also got the second Opulence set up today - Marvellous Metallics - I do love these paints. If you follow facebook, we have a superb Australia Day weekend special going. Thanks for all the comments about blogging. I have had heaps of emails with your comments and I do intend to carry on as always. Back to watching the women's tennis final. Ian bought me a bunch of lovely roses - he knows the way to my heart. I have one puny rose growing in the garden and would love to live somewhere where I could have lots and lots but they don't suit our place so buying a bunch for the house is wonderful. The other night - it rained and was rather cold - we managed our bbq - we had a lovely piece of rump which I marinated and we cooked in one piece - one of the nicest meats we have had for ages I think - and I made a fruit, tomato and mint salad and forgot to add the feta - never mind - next time. It was dark but this is what it looked like on the dish and it was very tasty and they went well together. Today I have been working on a little book - I think this is the cover. It is for an article I am writing so there will be quite a few more pages to go - or go. I have a heap of stuff in various stages all around and about. How would you like to spend a week in Abrezzo in Italy next year - with me! I am really excited about this - I have always wanted to teach in Europe so I am hoping it will happen. I have so many ideas beyond what is written on my page and actually have some pages for a little book in various stages on my table but I am keeping it all as surprises. No excuses - the days roll by and the heat rolls in and then fortunately out. Lots of pleasure from my waterlily this summer - the little purple one - it is flowering two at a time. I love looking into them because the eucalyptus trees reflect in the water - there are two buds all ready to open up tomorrow and about 6 more waiting in line. I think we have had about 10 so far. Last year it was errant and not a flower - this year the other one is having a holiday. I talk to them severely from time to time. I have been working on several projects for several different end results - this is part of some work I am doing using cocoon strippings - all will be revealed before too long. And I am also working on some new work under my favourite theme of Kimberley Dreaming - again watch this space on this one. And more playing with the Opulence paints - this is Triesse and Blanche - not so easy to show in a photo but great. and the earth elements - these different sets should be on the website pretty soon in special sets - I am also working furiously on the notes I am writing for them -I think we all need suggestions for use other than just opening the jar and putting a brush inside. I have loads of ideas to go in each set. The other night we went to Les Mis and for fear of being shot down in flames, we thought it went on and on like a Beethoven Symphony or an Wagnerian Opera. We didn't walk out though and stuck it to the end. I thought the singing was pretty awful in places - the songs are very difficult to sing as they have such a range and poor Rusty had a few problems - I did keep hoping he would fall in the water sooner than he did. And anyway he looked incredibly like Piru Weepu at times so we were expecting a few rugby goals to be kicked. Yes I am being frivolous and I wonder what the other lead actors have been like seeing that Hugh Jackman won the Golden Globe award (thanks Internet police). I thought his acting was great but his singing... The opening scene was fantastic and set a standard. Photo shots brilliant. Now shoot me down in flames. Apart from all of that, I have been busy packaging, counting, ordering and all those things you must do. I got Ian to help me count one of our thread types and he is busy thinking of a better way to deal with them. Excellent. QA#61 arrived this morning - we have sent them all out with a few left over if anyone is wanting a copy. I am working on ideas for the Perth show in August and have so far gathered some wonderful artists from all over the globe to participate in an exhibition. It will be worth coming just for that. But I am also working on other activities as well. Check out the tab at the top of the blog from time to time. I have a challenge coming up but am working on that. I have started swimming again now that the Beatty Park swimming pool is reopen - the seats etc look the same but I think there are more lanes. Started with 10 laps and up to 14 so working my way back to 20 and then a bit faster. I do love swimming - it is so refreshing and you can plan your entire day while you trudge up and down. I met a lady one day who gave me a list of boutiques she thought I should be buying my clothes from Amazing. I only had togs on..... Fortunately I haven't seen her again. Off to sort the bbq - yes it is raining a bit but we are happy. Harley is not - she does not like the vacuum cleaner, rain, cold, lightning or thunder. It has been stinking hot here - temps around 40 but yesterday it rained and then it ended up like the tropics. No need to go to Bali but it would be nice to pop in the pool and be waited on. I have been busy playing with the Opulent paints. I really love them so I am working on a bulletin and new sections for their place on the web. this is the spectrum series - the 12 colours of my palette. Click on them to see the rich mica in each colour. These are neat from the bottle but I have been watering them down and love the different effects. This Spectrum Collection of 12 will be on the web pretty soon. I painted a colourwheel using the Sunburst stencil - actually I painted a very lopsided one because I didn't count the spaces so I did a second one. 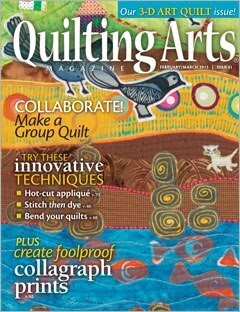 This is the one I have been using - it is called Grafitti Circles and it's great. It has so much on it. I used it with straight paint and then I layered a couple of colours and spritzed it with water then printed and then in a couple of cases, sprayed water over the top. Once these paints dry they stay - you cannot move them. But you can layer them as they are transparent. A little further down the palette mixing colours. I have been working on cotton poplin this time. The brain only copes with so much in this heat. and I finally fnished the little stitchy piece I started in NZ - just a few touches of pohutukawa red. Wow - well I meant to write on New Year's Day and say Happy New Year - we have been so busy that I failed. It has been horrible and hot but not tragic like poor Tassie - my heart bleeds for you all. I have been playing when I can with my Opulent paints - I am putting together an e book and hoping it will be ready in a couple of weeks. I like instant results but occasionally I am actually realistic. 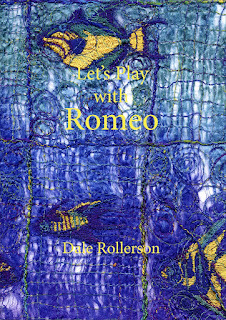 Let's Play with Romeo is having its final update and will be off to be printed on Monday so not far away. If you get our newsletter and I would think many of my blog readers do - well - what a response to it this month. Distress Stains almost depleted and the hand dyed wool blanket stacks - I think there are 5 left and I made heaps with all the offcuts. And they didn't even make the website. Now I am making hand dyed cotton packs becasue I know that our customers like little bits to play with - we had people here this week who wanted loads of little packs because that is something people know us for. This one was fusible webbing and it is quite esoteric. Remember any you stuff up can always be fixed up with pencils, crayons, stitch etc.